My interest in the music of Heitor Villa-Lobos reaches back to long before I committed myself to writing seriously about music-making. Like many, my “first contact” came from the first movement of the fifth of his Bachianas Brasileiras pieces. However, it was only after I acquired the EMI box set of all of the Bachianas Brasileiras compositions that I began to appreciate the composer’s inspired interleaving of the influence of Johann Sebastian Bach with his own Brazilian heritage. When I began write for Examiner.com, I took the time to begin to explore other aspects of Villa-Lobos’ work. I found a collection of all of his string quartets; and, when Naxos began its project to record all of his symphonies, I made it a point to track their progress release-by-release. By the time that project concluded at the end of last year, this site had become my primary outlet for working out my thoughts about the composer. 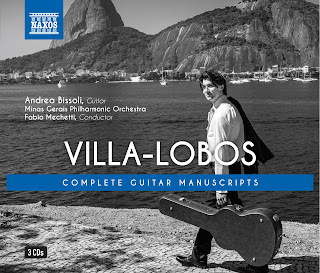 As a result, when I recently learned about a Naxos box set of Villa-Lobos music entitled Complete Guitar Manuscripts, my curiosity got the better of me, even though the collection had been released in November of 2016, bringing together single-CD releases from the three previous years. Sadly, the title was a deceptive one, beginning with the fact that two of the pieces in the collection (rather lengthy ones at that) are scored for full orchestra without a part for a guitar! After putting a fair amount of time into searching for useful background information (which did not seem to be included with the recordings themselves), I discovered that the collection served as a platform for “rare and recently discovered works,” which were interleaved with selections that had already been published and catalogued. The overall project was based on research by the guitarist recorded in this collection, Andrea Bissoli, who clearly had a great interest in tracking the historical record as far back as he could. This is particularly evident in the set of twelve études for solo guitar. These were dedicated to Andrés Segovia, and the autograph is dated 1928. However, these pieces were not published (by Eschig) until 1952, by which time they had gone through two revisions. It would not surprise me if Bissoli was the first to record these pieces from the 1928 manuscript. On the other hand, I have discovered that one of the things I enjoy the most about Villa-Lobos’ music, regardless of genre or medium, is the way in which he can deliver even the most demanding and/or virtuosic compositions with an almost deceptively casual rhetorical disposition. I am reminded of how many of the pioneers of jazz resisted publication on the grounds that they would never think of playing anything the same way twice. Whether he is playing something familiar or providing “first exposure” to one of his manuscript discoveries, all that really matters is whether Bissoli can capture the sense of spontaneity that Villa-Lobos could bring to his own performances. From that point of view, he is satisfyingly consistent in his delivery across the three CDs in this collection. When he is absent from those two lengthy orchestral selections, his absence is definitely missed. What matters is the style that Bissoli brings to playing Villa-Lobos’ music, and it is his stylistic stance that brings the most value to this no-longer-new collection.